Hooves thud along the turf and a troop of thoroughbreds gallop into a heart-stopping final furlong in front of a raucous crowd. Jockeys bob their heads mechanically as the commentator spills more words over his microphone with every passing second. Then a nanosecond of silence just before the stable pass the finish line. Cheers go up, heads go down, and if you listen very carefully, you’ll hear the juxtaposed sounds of betting slips being ripped apart and money being counted. This little scenario describes a typical meeting at Windsor Racecourse – the home of excitement, ecstasy, and enjoyment all through the summer. 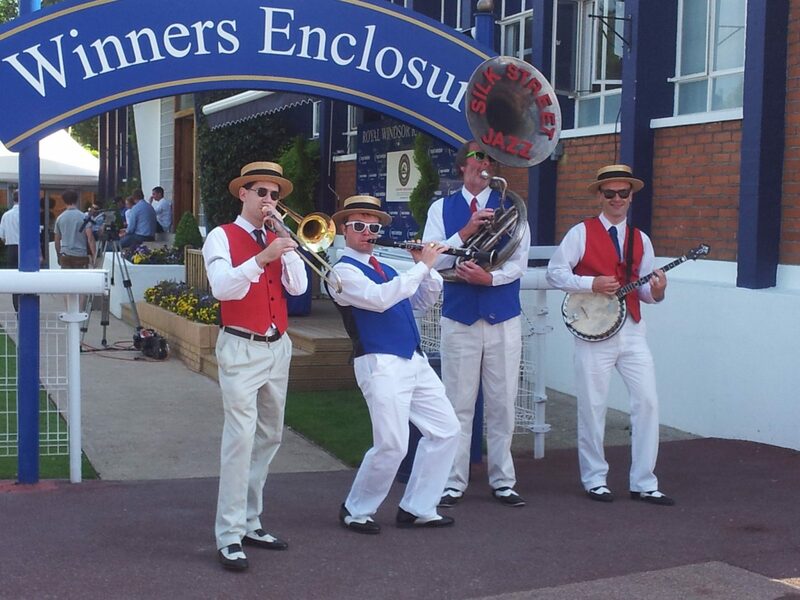 Our jovial band welcome the guests into Windsor Racecourse every single Monday, performing at the entrance gates to get the dolled-up punters dancing before they’ve even finished making their way to the allocated stand. Bellowing a mixture of lively tunes to get the crowd in full swing from the first minute, we take a wander around the venue itself once the races have kicked off – striking up songs in the lulls to keep the mood upbeat. Dressed in fine attire to rival even the most dapper looking ticket holders on the day, Silk Street Jazz band stroll through every stand with brass, string and woodwind in hand. Playing a grand selection of cheerful songs from the first race to the last, we get the party started early and keep it going all day long. If the sun has got his hat on, you might even be lucky enough to see us rocking shades as well as funky jackets. If you’re thinking about booking a jazz band for an upcoming event and you enjoy a cheeky flutter on the horses from time to time, you should definitely head on down to Windsor Racecourse to see us in action! All the fixtures are available at the venue’s website. Remember, we’re there every Mondays – turning the week’s most notorious day into a big bag of fun for everyone lucky enough not to be in work. Feel free to get in touch on 0800 756 5512, or send us a message using our online chat system. Our offices are open from 8.30am until 6.00pm, Monday to Friday. We’d love to speak with you and answer any questions you may have.